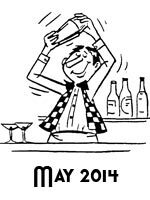 Professional Bartending School of Nashville is proud to announce that we are approved for the MyCAA Scholarship program. This program helps military spouses with continuing education that will help them gain positions in high growth occupations. We are honored to help military spouses be able to attend our award winning school and assist them in getting jobs in the wonderful and profitable career of bartending. This program is offered to spouses of active military, National Guard, and Reserve components. Click HERE to see if you qualify. Each month we will select one of our recent graduates who are working as a bartender in the greater Nashville area and do a short story on them. Check back each month to read about some of our many success stories. 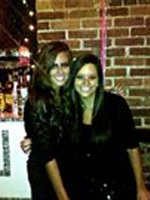 If you would like to see your picture here call us at 615-885-5800 or in the local area 1-800-Bartend. Speak with one of our counselors to get your start in the lucrative career of bartending! Call us now! 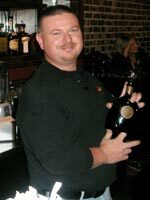 Hershel M. is our February 2013 Bartender of the Month!! Hershel graduated the Nashville campus in July 2012. Hershel is a great success story. He had a lot of bad luck in his past. He was a former ironworker who suffered an injury that ended his career. He has turned his life around through bartending. He moved to Tennessee and was unemployed when he decided to attend the school. Hershel was hired at the Schermerhorn Symphony Center in September where he works with fellow graduates from the school. Hershel says “what I like about bartending is meeting and interacting with new and different people while I’m pouring them happiness”! He personally thanked Randy, the Nashville campus’s job placement director, and the support of the school for the opportunity to work at the symphony. Hershel is one of our favorite graduates and we are so proud of his success. Yasmine R. is our January 2013 Bartender of the Month!! Yasmin is a past graduate of the Nashville campus. She is currently working at Club Miami. She was formerly an office clerk at Dell and was tired of working a 9-5 job. She currently attends Nashville State Community College full time while raising her son. Yasmin says “her bartending schedule works great with both”! “What I love most about bartending is having a blast while making money” Who wouldn't love that?” Yasmin stated. She also told us “it really is an honor being Bartender of the Month. I'm only where I am in bartending because of the school and Randy finding me my first job”. Well it’s an honor to have you as a past graduate, Yasmin! Great job! Katie M. is our December 2012 Bartender of the Month! Katie graduated from our school in September 2012. After graduation she landed a job at The Hermitage Hotel’s Capitol Grill restaurant. The Hermitage Hotel is the only Forbes Five Star, AAA Five Diamond hotel in Tennessee. Katie said “working at the Hermitage Hotel is classy and brought a whole new level to bartending”. Her fellow bartenders had bartended all over the country and had bartended for many years when they went to work at the Hermitage Hotel. Katie’s only experience was attending the school and on the night the Nashville staff visited her she was hanging right with the old pro’s! Katie really enjoys creating new drinks with her fellow bartenders and also having the drinks they create end up on the menu of such a prestigious restaurant. We are proud of Katie for landing a job in truly one of the nicest restaurants in all of Nashville. Way to go Katie!! 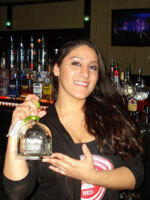 Christina C. is our June 2011 Bartender of the Month!! Christina graduated in May 2011 and immediately went to work at the Nashville International Airport. 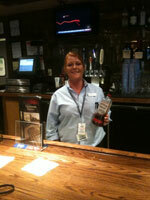 She absolutely loves bartending at the Nashville Airport. She says “there is never a dull moment”. She has met several entertainers such as Jon Cryer from “Two and Half Men”, Brian Setzer (guitarist from the Stray Cats), and the Judds. She loves the flexible hours and the fact that the airport has early evening hours which allows her to still have a life. But she made no bones about it “she loves the money there”! Well keep having fun and making that money Christina! We are proud of you! Nikki W. is our May 2011 Bartender of the Month!! That quickly changed when she landed a job at the Nashville Airport. Nikki enjoys bartending at the Nashville Airport because she gets to meet people from all over the world and she feels confident in her skills when she goes to work everyday. She loves bartending and the fun she’s had meeting people like Carrie Underwood, Lionel Ritchie, and Billy Ray Cyrus! 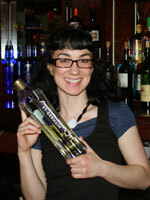 Caroline E. is our April 2011 Bartender of the Month! Caroline graduated the Nashville campus in March 2011 and has been working private parties for the school since graduating! Due to Caroline’s schedule with training horses and raising children, private parties were the perfect fit for her and her hectic schedule. Caroline has worked weddings, Predators Hockey Playoffs, concerts, Fridays at the Frist at the Frist Center, and a fundraiser for the YMCA featuring Amy Grant and Vince Gill. 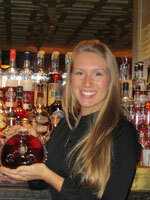 Kristen A. is our March 2011 Bartender of the Month!! Kristen graduated from the Nashville campus in February and she has enjoyed bartending many private parties and events in the Nashville area since finishing the program. She has worked all kinds of events including weddings, charity benefits, and the East Nashville Beer Festival. She works with the campus placement director on getting many of the events, but also her clients that she has bartended for have referred her to other events too. Kristen says “she can be shy, but parties have brought her out of her shell and she actually feels like she’s part of the party when she works”. Kristen says “each party is a different experience and exciting”! Good job Kristen!! 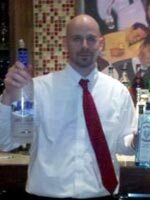 Kris F. is our February 2011 Bartender of the Month! Kris F. graduated the Nashville campus in January 2011 and quickly landed a job at the Macaroni Grill at The Avenues in Murfreesboro, Tennessee. Kris works in the mental health field and earned a degree from MTSU in 2007. He loves the flexibility and the steady and supplemental income he earns from bartending. His bartending job has been very flexible and have even giving him some time off so he could travel this month for training with his regular job. Congratulations Kris on quickly landing a great bartending job and making our school proud!! 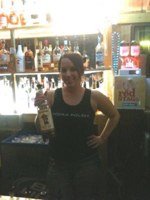 Ruthie D. is our January 2011 Bartender of the Month! Ruthie graduated the Nashville campus in October 2010 and landed a job at Smoky’s in Clarksville, TN in November! Ruthie had moved to the Clarksville area from Alaska when her husband was transferred to Ft. Campbell, KY.
She loves the interaction with her customers. Ruthie has plenty of regulars and a steady stream of soldiers who frequent the bar. She loves the continued fast pace! Bartending is flexible enough where she can still work at a daycare during the daytime. Congratulations Ruthie on being named January’s Bartender of the Month!! 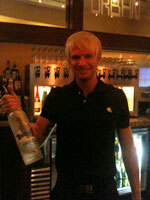 Cody K. is our December 2010 Bartender of the Month! Cody graduated from the Nashville campus in April 2006. He has worked at various bars but now is bartending at the Urban Flats in the Gulch area. The Gulch is one of the hottest areas in Nashville and Cody loves the clientele that frequents his bar! Recently Cody was nominated and was a top finalist for Metromix's Bartender of the Year! Cody moved to Nashville from Illinois when he was 18 years old and attended the school right after he moved here! He landed a job quickly upon graduation and has proven to be an awesome bartender, as well as an overall great guy! Great job Cody! 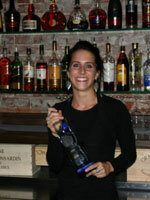 Elizabeth M. is our November 2010 Bartender of the Month!! Elizabeth graduated in October 2010 and was immediately hired at the Embassy Suites Airport location. She works part time at the Embassy Suites and loves meeting new people and hanging out with the regulars that frequent her lounge. She also enjoys the variety of drinks she gets to make working in a hotel. Before Elizabeth attended the Professional Bartending School of Nashville she was a caretaker for the elderly. She wanted to do something fun and she didn’t want to be stuck in a cubicle. She also wanted the freedom to travel at some point and knew she could bartend anywhere. She enjoyed the school and misses the fun instructors. She still hangs out with fellow classmates she had met at the campus. Congratulations Elizabeth! Lauren B. is our October 2010 Bartender of the Month!! Lauren graduated in September 2010 and has already landed two awesome jobs in Downtown Nashville and has also worked a private party with one of our other graduates and a friend of Lauren’s named Haley. Lauren was originally a server but she had an interest in making drinks and wanted to work behind the bar. She didn’t want to spend time trying to work her way up which is a timely process so she attended our campus. Lauren currently is working at Decades Night Club on Broadway Blvd. and also at Luau Louie’s Hoola Hut on 2nd Avenue. 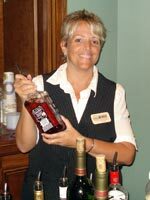 She loves the fast pace behind the bar and meeting fun people every night. She loves bartending at private parties for extra money too!! Great job Lauren we are proud of you!! Chris S. is our September 2010 Bartender of the Month!! 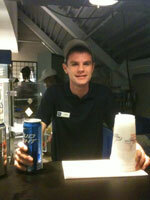 Chris is currently bartending at Bridgestone Arena while he attends Belmont College. Chris loves bartending at the Arena for the flexible hours which allows him to work at a local radio station in Nashville too. Chris is pursuing a career in the radio and music industry. He loves working the concerts at Bridgestone Arena especially due to his love of music and the money typically is outstanding during concerts. Most of our students at Bridgestone Arena say they make $200.00 or more for every concert they work. Chris also enjoys networking while he bartends. Keep up the great job Chris. 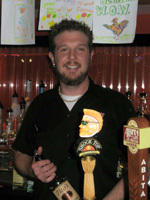 Jerrick K. is our August 2010 Bartender of the Month!! Jerrick is currently bartending at the Aloft Hotel in Brentwood, TN. He graduated our campus in July 2010. 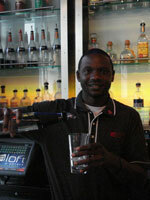 Jerrick chose to bartend for the fun it offers and bartends part time at the Aloft Hotel. Jerrick is a past graduate of Auburn University and is an architect by day. He likes bartending because it’s flexible enough to do around his current schedule. He loves getting to know his customers and the camaraderie between him and the other staff. He says it’s a relaxing atmosphere working at the Aloft and he gets off early enough so that he can work his day job too!! Great job Jerrick!! Shelby T. is our July 2010 Bartender of the Month!! 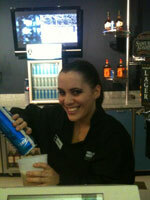 Shelby is currently bartending at the Bridgestone Arena at the Main Concourse bar. Shelby graduated the PBS campus in Nashville back in March 2010. Shelby works besides fellow graduates at her bar and loves bartending concerts and hockey games. Shelby’s first week of bartending at the Arena, she made over $1500.00 and was hooked on not only the money she made but the fun she had during her first week of bartending. Shelby had a friend who attended the school first and got a job bartending, so when Shelby graduated cosmetology school she attended our program!! Great job Shelby!! Andrew P. is our June 2010 Bartender of the Month!! Andrew is currently working at the Marriott Hotel in Cool Springs. Andrew graduated in October 2009 and landed a job at the local hot spot Red Rooster on Demonbreun Street! Andrew spent 10 years in the retail industry and wanted to do something fun with more flexible hours so he could go back and finish college. He loves bartending at the Marriott because of the better hours and more money. He also likes the freedom he has to invent drinks and is responsible for the Daily Drink Specials! He even created a drink that landed on the Marriott’s drink menu. Great job Andrew!! We love your attitude! 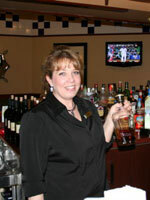 Marilyn T. is our May 2010 Bartender of the Month!! Marilyn works at the Bridgestone Arena and loves working concerts and sporting events. She says she enjoys listening to the music from various artists while she is actually making money! The night we saw her, she was working the main bar on the lower level! Three of the four bartenders behind the main bar were graduates from our campus. Marilyn was holding her own with several of our graduates who had been working the arena for years. Keep up the fantastic job Marilyn!! 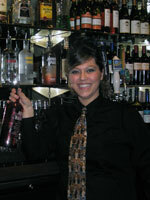 Jennifer B. is our April 2010 Bartender of the Month!! Jennifer graduated the Nashville campus in February 2010 and landed a job at the Nashville Airport in March 2010. Jennifer has been in real estate for years and wanted to do something to help supplement her income during the current economy. She chose bartending because she thought it would be fun to have a second job that you could actually have fun while making money. She loves the fast pace working at the airport. It’s never a dull moment with travelers coming and going! She also enjoys meeting people from all over the world. Keep up the great job Jennifer!! 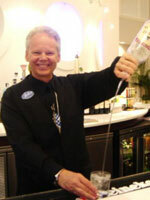 Steve B. is our March 2010 Bartender of the Month!! Steve graduated from the Professional Bartending School in August of 2008, and quickly landed a job at the Elks Lodge in Brentwood. Steve worked his way up from bartender and is now the Club Manager. He loves the interaction with his customers and the type of clientele he deals with there on a daily basis. Steve spent twenty years in the car sales business and finally got fed up with the "rat race" as he put it. He said the school helped him out because he had no experience in the bar industry. He said the school taught him alot more than just making drinks. He learned organizational skills and obtained confidence which helped him behind the bar and in working his way up to Club Manager! Good job Steve on making our campus proud!! 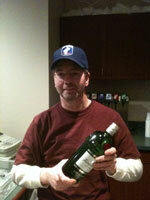 John H. is our February 2010 Bartender of the Month!! 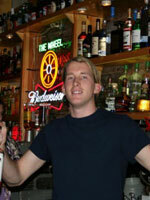 John graduated our course in November 2009 and is our Bartender of the Month for February 2010. John is a highly motivated bartender who thrives on being the very best at his trade! John took the flair class upon finishing our program and continues practicing his skills of bartending and flair even after landing a job and doing several private parties. John is bartending residential private parties, music promoter parties, The City Club, and is also currently bartending at the Phi Bar & Bistro at the Hotel Indigo location downtown! His hard work definitely paid off!! Good job John!! Sam S. is our January 2010 Bartender of the Month!! Sam graduated from the Professional Bartending School of Nashville in late September 2009 and moved to back to Utah where he landed a job at the Wasatch Brew Pub. Sam is our January 2010 Bartender of the Month! He enjoys working at the pub. 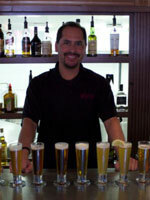 Recently a picture of him bartending was chosen to be featured in an upcoming book call Micro Breweries of the West. He expressed his thanks to the Nashville campus in a recent email that he sent to the Job Placement Director. Sam is quoted saying “thank all of you again for a great experience!” He went on to say about attending our school “it definitely paid off in every aspect of the word”. We appreciate Sam and his success and look forward to picking up the upcoming book featuring Sam and Wasatch Brew Pub as one of the best Micro Breweries in the West!! Great job Sam! 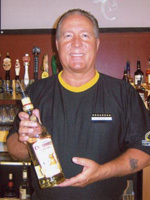 I recently sat down with George B., the “Bartender of the Month” for December 2009. I can honestly say after visiting with George he is fired up about the profession of bartending. He has taken bartending to new heights from inventing new drinks to developing his own bartending business. George graduated early May 2009 and bartended his first wedding two weeks later. George got his first official job bartending a few weeks later at Buffalo Wild Wings in Spring Hill. He loves working at Buffalo Wild Wings and the interaction he has with his customers, especially entertaining them. George attended the Flair Class at the Nashville campus and has made a lot of extra tips by doing the bar tricks he learned. Since graduating George has started his own bartending service that specializes in corporate events, weddings, and private parties. George says attending PBS changed his perception of bartending from alcohol, the business side of bartending, and customer service. Attending the school gave him the confidence that he brings when serving his customers. 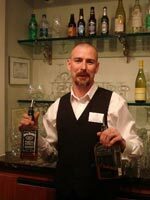 Look for an upcoming blog about George B. and his bartending service at NashvilleBartendingSchool.com! Here’s to you George!! 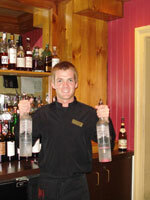 Sam "Sambuca" G. graduated the Nashville campus in August, 2006 and is our Bartender of the Month for November 2009. Sam was immediately hired at Fulin's Asian Cusine upon graduation! In September, 2007, he was hired at Chappy's on Church and quickly moved up to bar manager. Chappy's specializes in New Orlean's creole style food and the restaurant was voted Nashville's Best Cajun/Creole Food for the last 3 years by the Nashville Scene Magazine's readers. Dan F. is living the dream that you've seen in the movie "Cocktail"! Dan graduated the Nashville campus in February 09 and landed a job upon graduation at TGIF's in Rivergate. Dan is quickly becoming well known as one of the best bartenders in Nashville and in the State of Tennessee. Dan attended PBS's Flair Program that is held at the campus upon graduation and quickly picked up the art of flair. He recently won the competition at the Friday's in Rivergate and went on to compete in the TGIF's Regionals facing bartenders from around the State. Dan finished second overall, but he has vowed to go back and take first next time. Dan is the man and has a huge following at his Friday's! Congratulations Dan on your hard work and for representing the Nashville campus as putting out Nashville's best bartenders! Diana D. graduated from the Nashville campus in April 08. She quickly landed a job at Wild West Pizza where she worked several months before landing a job at the tiki bar at the Holiday Inn Select Airport. Diana enjoys the atmosphere of working at the tiki bar in the atrium. She has a diverse group of clientele who frequents her bar. Diana makes a mean Bloody Mary which was the drink of choice the Sunday afternoon that I visited her. She has a wonderful personality and definitely deserves to be this month’s Bartender of the Month! Lucius is from the small town of Winchester, Tn. which is between Chattanooga and Murfreesboro. He was attending Middle Tennessee State University at the time when he decided he wanted to do something fun! at Margaritaville and typically averages $200 - $300 dollars a shift. Tim S. graduated the Nashville campus in May of 2008. Tim was working as a bar back at The Wheel, but after graduating from the Nashville campus he was promoted to full time bartender. The night we visited Tim at The Wheel, the placed was slammed with customers but Tim was slinging the drinks out left and right! He loves the fast pace and he has unlimited energy. Also, Tim is a musician and working at The Wheel allows him to interact with fellow musicians who play at his bar and frequent The Wheel as customers. Keep rocking Tim! Melissa M. graduated the Nashville campus in March 2008 and was hired at the Embassy Suites Hotel. On the night I visited Melissa at the Embassy Suites she introduced me to some of the new products that had just arrived at her bar. She informed me that she enjoyed meeting all kinds of interesting people by working in a hotel. The benefit of working at a hotel is that you make a wide variety of drinks daily for customers who come from all parts of the country and the world. Congratulations Melissa on representing the Nashville campus and doing a great job! Carley T. is a singer/songwriter who attended the PBS of Nashville campus after finishing up her Degree in Music. She landed a job at Valentino’s Ristorante. Carley has been working at the new upstairs bar which is absolutely amazing. It opens up to the outside terrace and the bar is beautiful. Carley enjoys the flexibility that bartending offers her to pursue her music career. She loves customers that frequent Valentino’s Ristorante. Great job Carley! Howard M. is a retired Principal from West Tennessee who graduated from the Nashville campus in April 2007 and was hired shortly after graduation at the Sommet Center. Howard bartends almost all of the events at the Sommet Center including Predator Hockey games, concerts, and various events throughout the year. 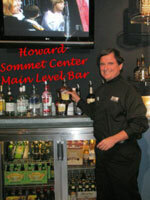 Howard works the main bar on the lower level. He loves his job at the Sommet Center. The money he earns makes the commute from West Tennessee worthwhile. The particular night that we took his picture he was working the main bar with two other graduates from the school. Laura is a singer/songwriter who graduated from the Nashville campus in February 2009 and is the Bartender of the Month for March 2009. Laura recently applied at the trendy restaurant and bar Mambu on Hayes Street. When Laura walked into Mambu’s Restaurant and Bar she decided she had to have the job. This trendy place seemed to fit her personality and she wasn’t going to take no for an answer. With the knowledge she gained at PBS and her personality she convinced the manager she was the right person for the job and now is very excited to be working in such a cool atmosphere as Mambu. Congratulations Laura for making us proud of you here at the Professional Bartending School of Nashville. 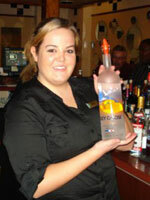 Felisha is a 2007 graduate of the Nashville campus and is February’s Bartender of the month. Felisha worked in retail before attending the Professional Bartending School of Nashville. She wanted to get a job where she could have fun and make money while she attended college at MTSU in Murfreesboro. Felisha landed a job at Mimi’s Café at The Avenues shopping complex. 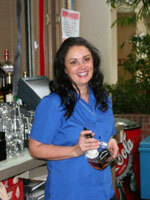 Mimi’s Café has a beautiful bar and Felisha loves the customers and the people she works with. Keep pouring those drinks Felisha!! 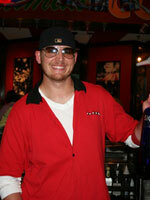 Schuyler is a 2006 graduate of the Nashville campus and is January's Bartender of the Month. Schuyler moved here from Pennsylvania and wanted to learn a trade he could use anywhere during good times or bad times. Upon graduation he landed a job at Lyrix as a bartender and also did banquet bartending at Gaylord Opryland Hotel and Resort. Schuyler took a job with Wow Cafe and Wingery at Providence in Mt. Juliet when they first opened and they recently celebrated their one year anniversary. 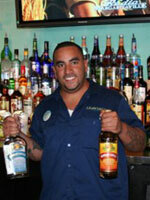 Schuyler loves the camaraderie and laid back feel of bartending in a family owned restaurant. Check out Schuyler when you get a chance for great conversation and an awesome cocktail. 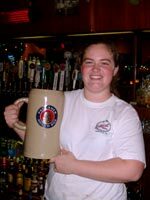 Deanna is a recent graduate of our Nashville campus and is now bartending at the Gerst Haus! Marcus is a recent graduate of our Nashville campus and enjoys bartending at the new Larriviere's in Mt. Juliet.